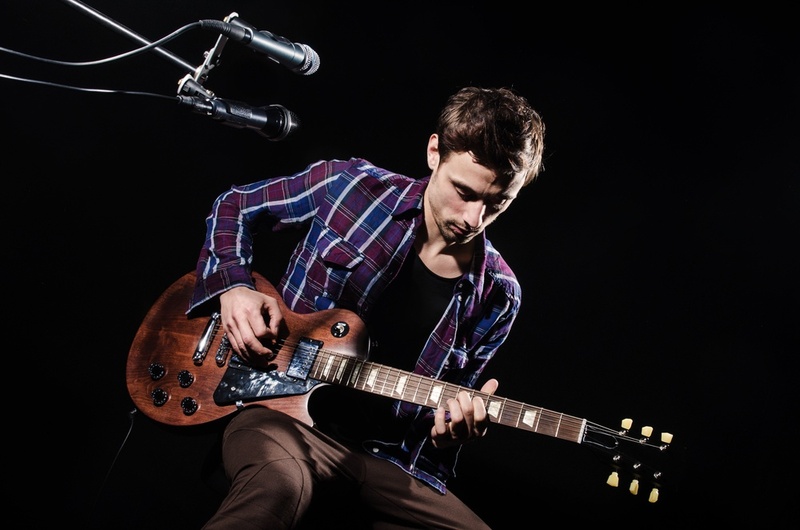 As part of finding the best tone, guitar players are constantly juggling the order of their effects pedals to find the best combination of low noise and great sound. It's a never-ending search, but there are some guidelines that come from come from pedalboard experts like Bob Bradshaw. There are two things that will directly affect how your effects interface with your amp: the effects order and gain staging. 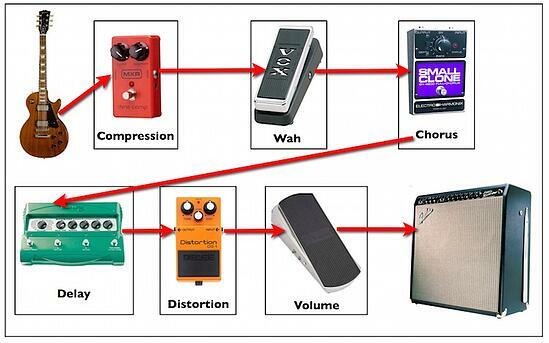 Effects order means the order that each pedal appears in the the signal chain between the guitar and amplifier. There are several schools of thought on effects order, and they each have a different result." Any distortion pedal must come first right after the guitar. The exception is if you’re using a compressor pedal, which will be first in the chain. Do not put a volume pedal first, as this can alter the way a compressor or distortion pedal sounds. Any modulation or tone devices like wahs should come next. This enables you to keep the sustain coming from your distortion or overdrive devices and alter an already harmonically rich signal. Delays come almost last in the chain, since you want to be delaying your already effected signal. A volume pedal comes either last in the chain, or directly in front of any delay. In situations where a pedal is providing a lot of clean gain, that will come last in the chain so as not to overload any of the other pedals. So, a typical effects order might go something like compressor --> distortion --> wah --> chorus --> delay --> volume pedal (see the graphic below). While this might not be the quietest order, it does sound really good because any distortion, overdrive, or sustain is being affected by the effects that come behind it. The noisiest pedal goes last in the chain before the amp. The one with the most gain goes last before the amp. The reason for both of the above is simple: if the noisiest pedal is first in the chain, that noise will be affected and amplified further by every other pedal in the chain that you switch on. 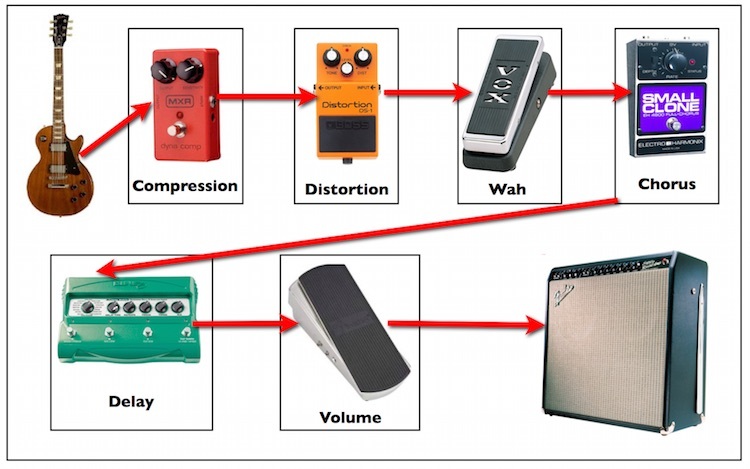 Same with the pedal with the most gain; if it’s at the beginning of the chain, it could possibly overload any other effect that comes after it, since most pedals only want to see a typical guitar signal and nothing greater (see the graphic below). Also, any noise caused by increasing the gain on a pedal will be amplified downstream by any other pedal switched on. Generally, you’ll try to keep the basic order as in school of thought #1 in order to be sure that any distortion or sustain is affected by the effects placed later in the chain. That being said, this order won’t sound the same as order #1, especially if a distortion pedal is placed last in the chain (which isn’t recommended) because of its gain, so it might not be for everyone.